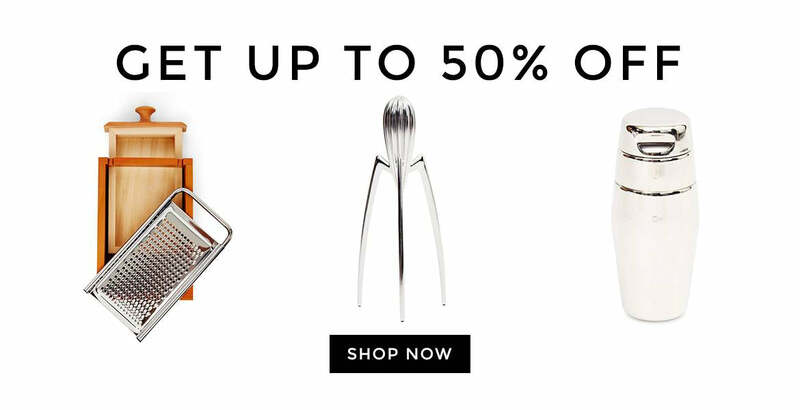 Everyone loves a good sale, and this Alessi sale will surely tempt you this time around. Alessi is a brand known worldwide as a luxury lifestyle brand with sought after products and our Alessi sale vouchers and discount codes will make purchasing an Alessi sale item a little bit easier. Alessi corkscrews and Alessi cheese graters will be in our Alessi sale, if you're lucky of course. Known for being a luxury lifestyle brand, Alessi have paved the way for modern, contemporary and sleek design of their products. With our Alessi discount coupons and discount vouchers you'll be able to grab yourself something stylish for your home this season. Whether you want an Alessi cocktail shaker or an Alessi juicer, if you're lucky, you can use our Alessi discount codes and sales vouchers to tempt you this season. If you didn't find anything in the sale, then why not check back in when it's Black Friday. Our Black Friday discount codes and discount coupons will give you an even bigger discount on our Alessi products. Across the site we'll have Alessi discount codes and discount coupons, so make sure to come back on Black Friday. To keep up-to-date with all of our future sales, or if it’s your first time here, then why not sign up to our newsletterto receive the latest editorial stories and Alessi coupon codes, plus 10% off of your first order from The Idle Man. Some of these Alessi discount codes and coupons may seem a little confusing to you, but have no fear, I’m going to explain all. If you spend over £50 at The Idle Man you will receive free shipping on your order automatically, so if that’s not an incentive to use this discount code, then I don’t know what is! If you fancy building up some credit with us, then why not try our Refer a Friend scheme for the best Alessi discount coupons and vouchers around. Share your discount code on social media or invite your friends via email to send them £5 worth of credit, you’ll get £5 when they spend £30 or more in their first shop. If you’re lucky enough to still be a student then hop over to our Student Discount page and get 10% off Alessi and host of other brands. Still not enough? Then try waiting for one of our special double discount days and get up to 20% off! But remember to qualify you will need a valid NUS or student card. Founded in 1921 by Giovanni Alessi in Valle Strona in the Italian Alps, Alessi started out making small objects out or wood and metal for the kitchen. Giovanni's son, Carlo, was named chief designer of Alessi and made their first coffee service in 1945. Over the decades, Alessi have gone from strength to strength in producing some of the most contemporary and design-orientated products in the worlThe latest news from style, life, arts, and culture and everything in between. Whether it's a new brand arriving into our style, our latest drops and editorials. You will never miss a beat with us.